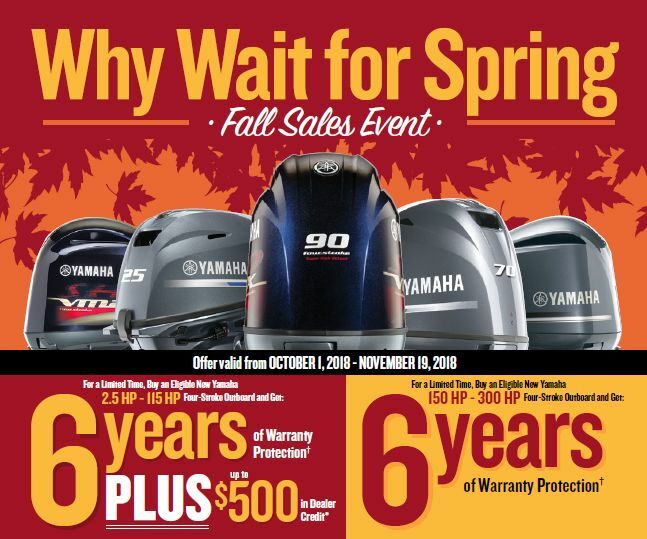 Home » Why Wait ‘Til Spring – Yamaha Special Incentives! Why Wait ‘Til Spring – Yamaha Special Incentives! Pier 33 is pleased to announce the Why Wait ‘Til Spring Fall Sales Event from Yamaha Marine. All new boats from Robalo and Chaparral, powered by Yamaha Outboards, are eligible for this special program, now through November 19. For a limited time, the “Why Wait for Spring” sales event allows boaters who purchase eligible, new Yamaha four-stroke outboards in the 150- to 300-horsepower range the opportunity to add three years of Yamaha Extended Service (Y.E.S.) to their three-year Yamaha Limited Warranty for a total of six years of coverage at no additional cost. In addition, customers who purchase eligible, new Yamaha outboards in the 2.5- to 115-horsepower range will receive three years of Y.E.S. coverage as well as a credit of up to $500 they can use toward the purchase of additional goods and/or services available at the authorized participating Yamaha Outboard dealer that sold the outboard at no additional cost. Additional terms and conditions apply. See your Pier 33 Robalo Specialist for more details or — better yet — visit our showroom to see a new Robalo today and take advantage of this special program by November 19!